I have a client who has just started coaching on my team. She's a freaking rock star and is teaching me so much. That's what I love SO much about this business is that you can constantly grow, develop, and become a better version of yourself. I have always had the intentions to meal prep on Sundays for the following week but have never ever tried it. I usually just meal plan and make a grocery list and call it good. But this week I wanted to give it a try. Also, I am a very BIG believer in leftovers. We house share with some of our good friends and so we swap nights cooking dinner so that's what that means by "Steph cooks". PREP: I cooked all of the scrambled eggs ahead of time, made the oatmeal in the crock pot overnight, and cut up all of the veggies that I'm going to need for the week ahead of time like the sweet potato, cucumbers to snack on, and tomatoes for Cohen to snack on because they are his favorite. With my eggs in the morning I've added sauteed spinach, bell pepper, and onion that I prepped on Sunday and it makes my breakfast AMAZING. Like breakfast is no longer boring when you add some color to it. ***As a tip when cooking scrambeled eggs and then reheating a few days later, put it in the microwave for 20 seconds at a time, take it out and stir, then repeat that until warm enough. Don't make it steaming hot cause you will over cook them, dry them out, and it will taste disgusting. Also, be sure to put a damp paper towel over the scrambled eggs to help lock in some of the moisture. SNACKS: For snacks I usually make some homemade kale chips during nap time cause that takes like literally 1 minute to throw together and 10 min in the oven. I keep almonds around at all times and I also have bananas around all the time as well that I like to slice up with peanut butter. All convenience snacks that don't take a whole lot of prep. 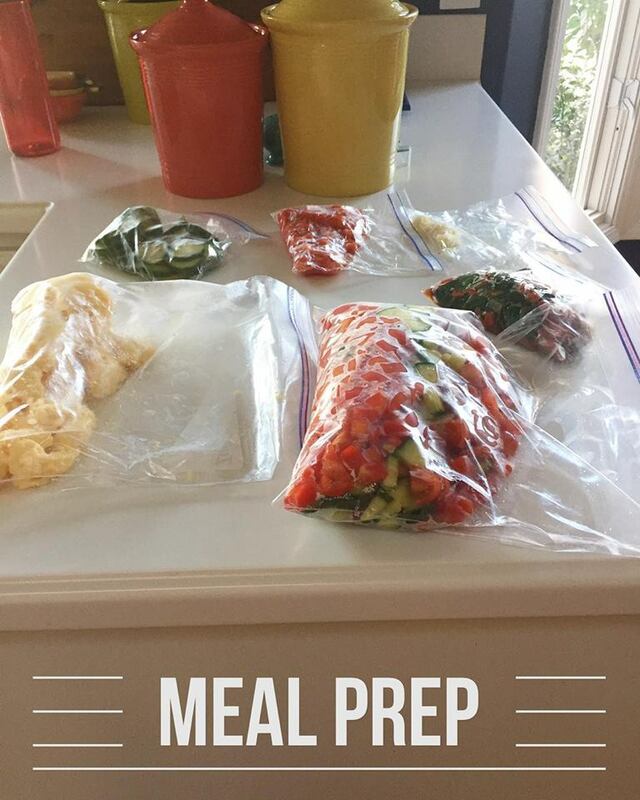 BENEFITS: Doing this has saved me so much time on thinking about what we are going to be eating for our next meal because even though I use to meal plan, sometimes something would come up and I wouldn't have time to spend 45 min prepping our next meal and getting Cohen and I fed before nap time or what not. So this has helped a lot with time and also LESS DISHES.